Add LDB1 polyclonal antibody - Classic to my shopping cart. Request a quote for a bulk order for LDB1 polyclonal antibody - Classic. Please fill out the form here below. Your local sales account manager will get in touch with you shortly and send you a quotation based on your requirements. Polyclonal antibody raised in rabbit against LDB1 (LIM Domain Binding 1), using a KLH-conjugated synthetic peptide. 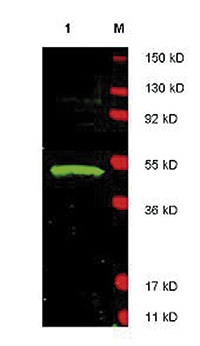 Western blot using the Diagenode LDB1 antibody shows detection of LDB1 protein in Jurkat whole cell lysate. Approximately 30 μg of lysate was loaded prior to separation and transfer to nitrocellulose. Primary antibody was used at a 1:1,800 dilution. Molecular weight estimation was made by comparison to prestained MW markers in (lane M). Diagenode strongly recommends using this:	LDB1 polyclonal antibody - Classic (Diagenode Cat# C15410269 Lot# 001). Click here to copy to clipboard. Using our products in your publication? Let us know! You are about to request a quote for Bioruptor® Pico sonication device.Fill out the form below and we will be in touch with you very soon. You are about to request a quote for SX-8G IP-Star® Compact Automated System.Fill out the form below and we will be in touch with you very soon. The European Regional Development Fund and Wallonia are investing in your future. Extension of industrial buildings and new laboratories. To ensure you see the information most relevant to you, please select your country. Please note that your browser will need to be configured to accept cookies.